This has been sort of a weird day tracking the weather in KS/MO…an area of light rain has moved through the KC area…this has cooled things down to 70-75° but more importantly has firmed up a stationary front towards the south of the KC area. Overnight tonight the winds above the surface will be on the increase…these winds will “overrun” the front and be force air to rise. That will create storms nearby. These storms will then have the ability of tapping into some VERY juicy air through the atmosphere (some of the juiciest air of the season as a matter of fact). This will allow the storms to dump very heavy rainfall in spots. Some of our model data suggests the potential of over 5″ of rain somewhere on the MO side especially. Something to watch for during the overnight hours. Good morning and thanks for stopping and checking in with the FOX 4 Weather Blog on this Friday…it’s a TGIF in the KC area and we’ve just had an almost perfect weather week (especially considering the time of the year that we’re in right now). Things though are changing and for the 1st time in a few days we have a LOT of clouds out there that should prevent temperatures from rising into the 90s again today. Rest of today: LOTS of clouds through this at least early this afternoon. There are a few VERY scattered showers out there as well. Highs today should be around 85°. Humidity levels slowly on the increase during the day today. There should be a band of rain move into the area from the west to the east later this afternoon and evening. How it holds together will determine how much of us get some rain…at 3PM it was weakening somewhat. Tomorrow: Partly cloudy and hot with a lingering 40% chance of storms, especially in the AM and then later in the PM and evening from KC southwards. Highs in 80s. A large area of rain is moving through central and eastern KS as I type this and it appears that it will make into the the KC area later this afternoon and early this evening. There is not a lot of thunder/lightning with this activity but there is some and that may move through parts of the area as well. Some locally heavy downpours are possible with this activity. Here is a look at the NWS radar from Pleasant Hill, MO tracking the rain moving closer to the area. Interestingly the thunder/lightning is on the backside of the activity as I type this. That may change as we get a bit more unstable this afternoon. Evening activities may be jeopardized by this rain as it moves into the area for awhile. As of this writing it may only last 1-2 hours though unless we get more redevelopment overnight tonight which is possible. Those clouds that are moving through with more out to the west of here, combined with a SE to S flow of some of the cooler air that has been circulating around the region this week should keep temperatures in check today. I was really fighting the high temperature forecast yesterday…I had various numbers from 87-89° written down in the afternoon and erased a few times…I settle on 87° and I think that may be too high in light of all the cloud cover that I’m seeing out there. We’ll see how the day pans out…but we need to get more sunshine for that 87° to be realized. This disturbance has been tracked since Monday when it was born in northern Mexico and has moved through AZ into the Rockies and now into the Plains region. Ahead of this disturbance SW winds aloft will move into the region tomorrow…and that will transport some hot air into the region as the 5000′ temperatures will soar into the 70s. This hotter air upstairs with enough sunshine and mixing of the atmosphere from the winds, should allow temperatures at the surface to soar as well…and 90-95° is possible tomorrow. Some of the new data today though suggests that this may not happen…while warm, perhaps not in the 90s. Then with the core of the disturbance by afternoon pushing to near Chillicothe-Kirksville, and since that core represents a pocket of colder air aloft, the combination of hot surface temperatures and colder air aloft will create lift…add in a wind shift moving through later in the day and the potential for additional storms is certainly there tomorrow in the area. It’s enough of a chance to be watched and it wouldn’t surprise me to see an isolated severe storm somewhere in the region in the later afternoon Saturday. Winds are the main threat with any storm along with locally heavy rainfall. Timing would be after 3PM Saturday. It does appear as if we should be dipping into the heat at times next week (especially after TUE into SAT) as the 90s should make a steadier return so we’re NOT done with summer yet and the pool will still get a lot of business before the end of the month. By the way thanks to the cooler weather this week…our monthly average through the 14th is now 3.3° below average…impressively cool for August and remember how the strong correlation between impressively cool weather in July dovetails into August that I pointed out last month…so far so good….now let’s see how long we heat up for. By the way…the tropics on the Atlantic side are still rather quiet, we’re coming into the time of the year where things should start to pop out there…and right now nothing significant is forming or will form for quite some time. One, of several reasons, is a pronounced layer of dust that continues to come off the African continent. This dust spreads across the central Atlantic basin through the breeding grounds of where systems try and form…and the dust combined with the dry air, prevents circulations from getting their act together…I saw this tweet today which I though was rather interesting comparing things int he Pacific and the Atlantic. Random tropical tidbit: 6 hurricanes have formed in East Pacific in last 3 months; 6 have formed in Atlantic in last 22 months. 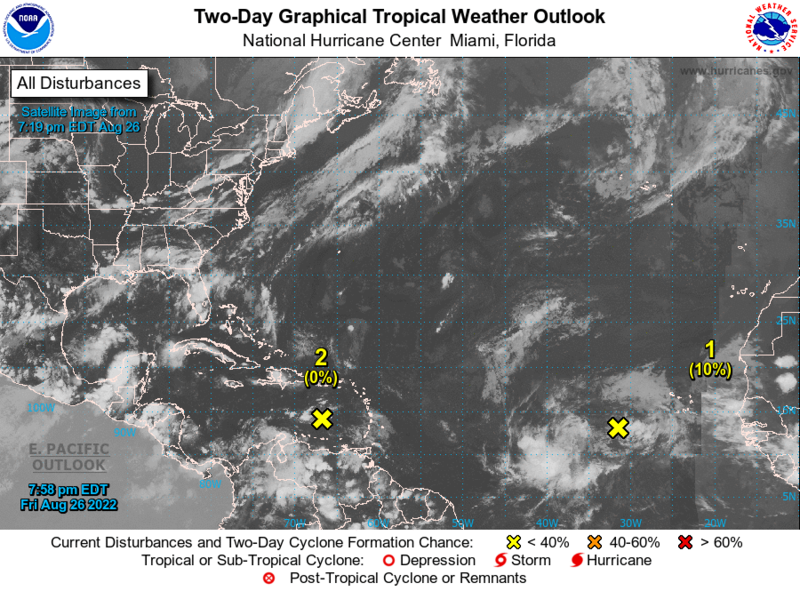 In reality we’ve had 2 named storms so far…on average the 3rd named storm occurs on the 13th of August with the 3rd hurricane not occurring till early September so while it feels like a slow start to the Atlantic season…really it’s not unusually slow…yet. That’s it for today…have a great Friday and I’ll probably update the blog at some point tomorrow before 2PM. Thank for the afternoon update Joe. Looks like La Cygne and areas to the south aren’t going to get much out of this first wave. We really need it down here too. I just want the rising sun set to peek up in the sky .